Why Does My Vet Charge $200 For A Dental Cleaning And My Groomer Will Do It For $15? The answer to the question about dental cleaning lies in the difference between what a groomer (or any unlicensed non- veterinarian) can do to clean teeth and what a vet means by “dental cleaning”. The groomer may not be trying to mislead you or to do anything unlawful. It is more likely that he/she just does not realize the difference between him/her brushing the teeth while your dog is in the bath and what is done at a veterinary hospital. A dental cleaning at my hospital, Applebrook Animal Hospital (and most high quality veterinary facilities) includes what we call A, T and P.
A-Anesthesia and Assessment means that the doctor evaluates each tooth individually with the patient under general anesthesia. With the patient sleeping comfortably, we are able to examine each tooth and probe gently around them all to see if there are gingival pockets or other suggestions of periodontal disease. More importantly, visual exam is not enough. We look, feel and probe and then we examine dental radiographs for a view under the gum line where we cannot see. Because anesthesia must be administered by a veterinarian or under the supervision of a veterinarian by a licensed veterinary technician, this critical step is a big part of the difference in cost. T-Treatment for any dental disease is the next step. 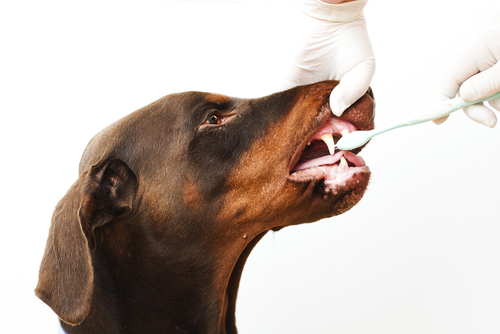 Diagnosis and treatment of periodontal disease fall under the provisions of the Veterinary Practice Act which defines items that are to be performed only by licensed veterinarians. During the Dental ATP, I will write down my findings and begin treatment for those issues that can be managed that day. P is for the plan I make to address any disease that requires extensive treatment, referral to a veterinary dentist or the at-home care regimen that I will suggest based on my findings that day. The anesthesia, the treatment administered and the treatment plan moving forward are all critical for your pet’s dental health. The time and skill that your vet has dedicated to your individual dog’s care are figured into the charges. The fee for this important and extensive service will be an investment in your dog’s comfort and longevity. There is no quick fix and no substitute for high quality care provided by a loving and well educated veterinary staff. That does not mean that your groomer cannot brush the teeth too, just be sure that you know the difference.